Join us for “A Night Under the Stars” Gala & Auction. 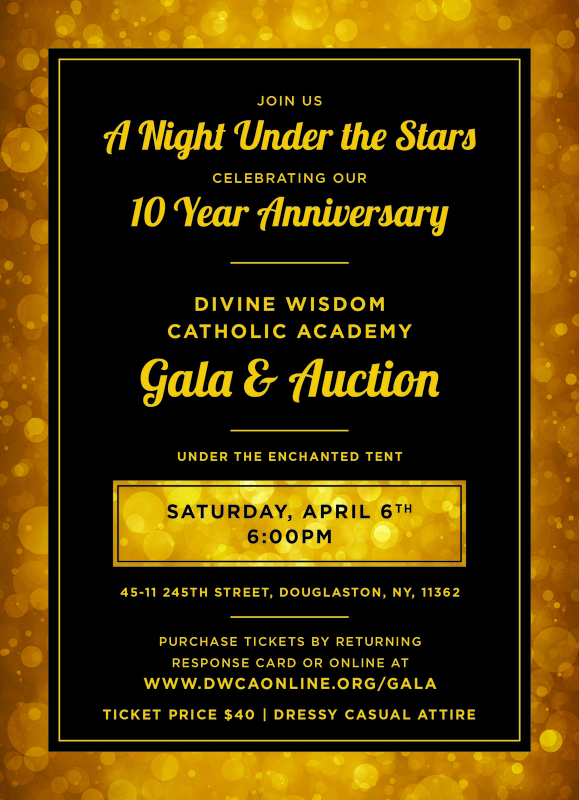 It is a yearly event attended by all members of the Divine Wisdom Catholic Academy’s community including alumni, parents, parishioners, faculty, administration, board, and friends of the academy. This year we are “Celebrating 10 Years.” under the Enchanted Tent overlooking our Peaceful Playground. The Gala features dining, dancing, live and silent auctions all in support of our students. Help support Divine Wisdom’s largest fundraiser, which directly benefits the excellent educational programs at our Academy. You may purchase your Spring Gala tickets below. Please enter information in the boxes before clicking on “Buy Now“.